Blondie and Brownie: What's Your Favorite Hot Sauce? I've been putting this traditional, fiery Portuguese sauce on eggs...cottage cheese...lentil salad...burgers...anything and everything. The trouble is, I'm down to my last few drops. And as long as I'm planning on stocking up on hot sauce, what are your favorites? I currently have a tube of harissa, two types of sriracha, and a bottle of Chili Garlic Cholula (which in my opinion is a sad, sad spin off of the original). What am I missing? What other hot sauces should I add to my collection? 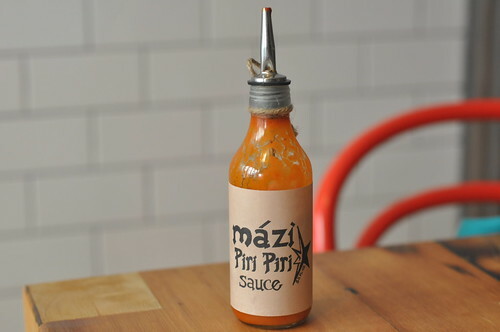 BTW, when you need to replenish that bottle of Mázi Piri Piri, you can get it online at Sickles Market out of NJ. Unfortunately it's not sold in stores, but my favorite hot sauce of the moment is the one at Jack's Wife Freda on Lafayette - it's light green, and almost has a creamy consistency. I was eating it straight out of the container they brought it in.